Lonza Wood Protection’s Anti Sapstain line of products includes many offerings intended to bring brighter, cleaner wood to the marketplace. 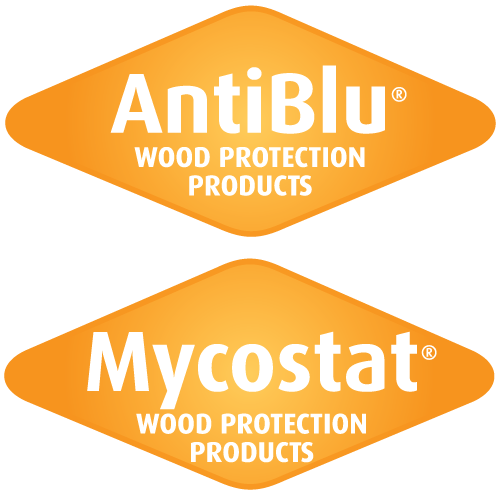 AntiBlu® products encompass cost effective components for controlling sapstain, mold, and decay fungi in freshly sawn and seasoned logs, poles, posts, and lumber. These products are intended for sawmills, exporters, log home, truss and utility pole manufacturers, and other timber operations. Lonza’s Anti Sapstain products can provide short or medium-term protection to freshly sawn and seasoned logs, poles, posts, and lumber in both spray and dip applications. Products applied by either dip or spray application include wood preservatives, mold inhibitors, defoamers, brighteners, insecticides, and end sealers. Solutions can be customized to suit your specific requirements. The science of lumber protection from Lonza’s AntiSapstain products are used throughout the North American sawmill industry resulting in billions of board feet of green and kiln dried lumber treated each year. Lonza brings its state-of-the-art solutions to customers by providing the most advanced spray systems and computer technology available within the North American lumber industry. Diaplex™ Lineal and Transverse Spray Systems are turnkey equipment made of high quality stainless steel. Smart Flow™ Computer Systems work in conjunction with the Diaplex™ equipment to provide real-time information on all facets of the process from equipment to product mixtures. Answers to the most often asked questions about Anti Sapstain products. We offer a choice of wood protection and enhancement products with a wide range of dilution ratios, giving you the flexibility to use them in a variety of applications. These products are used for the control of sapstain and mold in freshly sawn and seasoned wood and wood products. They can be used on lumber, as well as plywood, particleboard, OSB, and wood composite structural components.